Ms. Bernabela’s Class Helps in the Garden! Blog by Mr. Misch: Ms. Bernabala’s 4th students help to fill the first of the 12 beds in the new pollinator garden. It is amazing how quickly the students could move the dirt in a bucket line. STEM Lab with Mrs. Stewart’s Class! Blog by Mr. Misch: Mrs. Stewart’s 3rd grade class mixed mortar and built garden walls as part of their walls STEM unit. Will these walls be strong enough to keep out an imaginary rabbit? 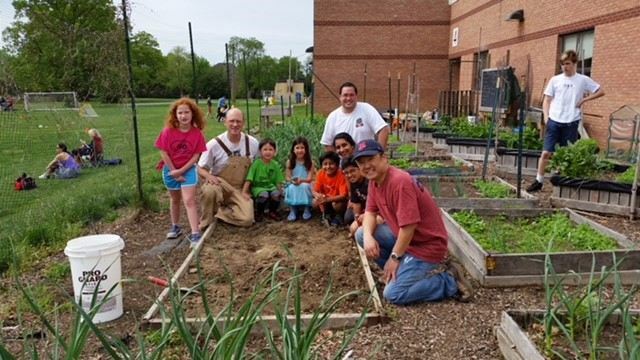 Blog by Mr. Misch: Many thanks to all of the hard workers who showed up for last Saturday’s garden work session. All 13 of the pollinator beds were leveled, filled, and planted: no small feat. Now to watch these plants grow and feed our pollinators.